This is the raffle quilt for our quilt group (Toowoomba Quilters Club Inc) for 2008. The quilt was designed by a group of members and quilted by a local professional quilter. (See the Toowoomba Quilters blog for some up close photographs of the magnificent custom quilting). 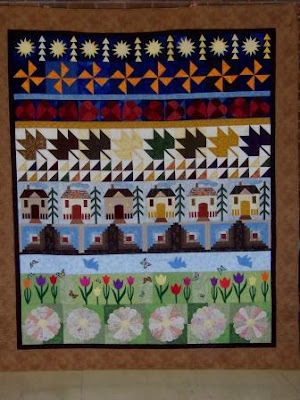 The quilt represents the four seasons of toowoomba in a row by row style, starting with summer at the top. Sue did a lot towards bringing the quilt together, so congratulations to her for this outstanding achievement. Now, I am off to pack some of my sewing gear up for our retreat. We start on Friday afternoon about 3.00pm with coffee at "The Chocolate Shop" at Highfields and of course, a visit to the Quilters Angel shop which is just a few short paces from the Chocolate Shop. Then it is on to Perseverence Dam (the one with very little water in it) where we will "camp" for 3 glorious nights. Glorious because there will be all sewing with no interruption of household duties. Breakfast, lunch and dinner served up to us - Bring it on!! !